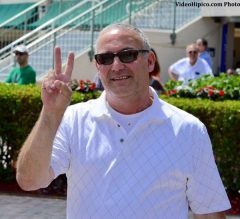 UPDATE: Stronach Group executive Tim Ritvo on Tuesday told the Paulick Report that entries from Allan Hunter and Marcus Vitali will not be taken at any of the company's racetracks and that the former Vitali horses currently running in the name of Hunter must vacate Gulfstream Park within 10 days. Click here for details. The saga of embattled trainer Marcus Vitali took a new twist last week, when his occupational license was displayed as “current – suspended” on the Florida Department of Business and Professional Regulation website. Vitali, who has been charged with 23 medication violations since 2011 in Florida alone, relinquished his training license in the state earlier this year, thereby avoiding sanctions for seven medication violations between October 2015 and January 2016. Vitali moved his tack to Maryland last spring, where shortly after arriving one of his runners tested for an overage of a non-steroidal anti-inflammatory, according to Maryland Racing Commission executive director Mike Hopkins. Vitali, whose entries were not accepted by some other tracks in the Mid-Atlantic region, returned to Florida this summer to settle his licensing issues. There, the division denied his license application, citing the seven unaddressed medication positives, and he escalated the denial to the state Division of Administrative Hearings last month. In early September, attorneys for Vitali and the department informed the Division of Administrative Hearings they had reached a settlement agreement, which resulted in his reinstatement. According to attorney Bradford Beilly, Vitali's license will be suspended for 120 days starting from July 1, 2016 (meaning the suspension should expire Oct. 29). The trainer was also handed a $7,000 fine. While Vitali was still waiting for the case to play out in July and August, the Paulick Report received information from multiple sources indicating the trainer was making regular appearances on the Gulfstream Park backstretch, gaining access with a visitor's pass provided by Gulfstream Park management. Eventually, sources say, he was making daily trips to the backstretch, where horses trained by Allan Hunter worked out in saddle towels bearing Vitali's initials. Vitali was spotted instructing staff, often when Hunter did not appear to be present. Beilly said Vitali was not entering the backstretch for the purpose of training horses without a license. Under the terms of the Stipulation and Consent Order Vitali signed Aug. 30, he is not permitted in restricted areas of a racetrack, including the stable area, during his suspension. There is no restriction on him watching horses train or race from the grandstand or front side of the track. Hunter, meanwhile, is enjoying one his busiest and most successful years yet as a trainer. Already, he has saddled more horses in 2016 than he did in the previous three years combined, winning at a nearly 20 percent clip – more than double his career average winning percentage prior to 2016. This year, Hunter's horses – many of them formerly trained by Vitali – have earned more than $206,000. Last year, they brought home $480. When queried by the Paulick Report, Gulfstream Park Vice President of Racing P.J. Campo explained in late August the track made a decision to stop allowing Vitali in the barn area due to the frequency of his visits. “He came and saw me (and) asked if he would be allowed to go to the races and watch racing,” said Campo via email. “I checked with the state steward and was told that he didn't have a license but also had no outstanding ruling. So, he was told as long as he behaved, he could attend the races and could visit the backstretch if he was signed in. Florida's statutes leave a lack of clarity about whether state officials were permitted to consider reports Vitali may have been accessing the backstretch without a license in order to train horses that previously ran in his name (if true, this would technically constitute a violation of Florida Administrative Code 61D-5). The state can consider past violations resulting in punishment in Florida, but it's unclear whether it was supposed to consider Vitali's long history of rule violations in Massachusetts, Maryland, and Pennsylvania dating back to 2005, or his total of at least 43 violations over the course of his career. There is one more item on Vitali's licensing resume the state knows about but could not consider when officials deliberated the deal that led to his being re-licensed: a closed complaint about animal cruelty. On March 27, 2013, Jay Stone, racing manager for owner Frank Calabrese, instructed trainer Luis Ramirez to claim the filly Tiz Mariand off Vitali for Calabrese in a $15,000 claiming race. Tiz Mariand finished sixth as the heavy favorite, more than three dozen lengths behind the winner. According to documents Stone filed with the Florida Division of Pari-Mutuel Wagering, Vitali told Stone after the race that Tiz Mariand had a slab fracture in her knee, and later provided Stone with X-rays taken a few weeks earlier by veterinarian Dr. George Burch, showing a third carpal bone sagittal fracture. 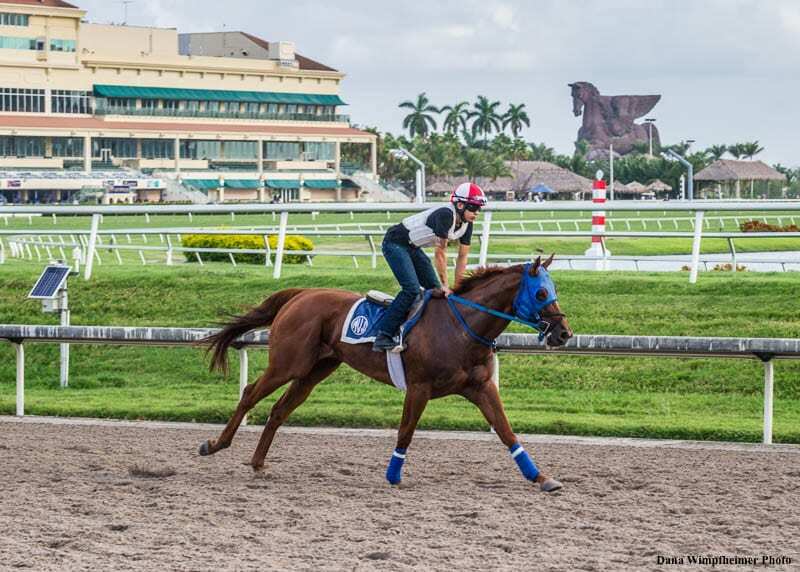 Knowingly running a horse with a broken leg might not constitute a violation of Florida's rules concerning horse racing, but the state processed Stone's complaint as a possible case of animal cruelty. Tiz Mariand passed a pre-race veterinary exam conducted by track veterinarian Dr. Patricia Marquis, and a follow-up examination by Marquis three days after the race revealed an “off left front” at the jog and “slightly stiff and wide left front,” though Marquis detected no heat or swelling in the leg. Dr. Scott Hay, who was retained by Stone to X-ray Tiz Mariand after she was claimed, told state investigators the horse should not have been allowed to race with the injury. His conclusion was echoed by Dr. William Watson, veterinarian manager for the Division of Pari-Mutuel Wagering, who reviewed the radiographs. For his part, Vitali said Burch took the X-rays and left them on his desk but never discussed the results with him. Vitali told state investigators the veterinarian had prescribed no medication for the filly and never told Vitali not to run the horse. That same report said Gulfstream President and General Manager Tim Ritvo was alerted to Stone's concerns of animal cruelty March 30 – three days after the filly was claimed – as was racing secretary Dan Bork. Stone was asked not to talk about his concerns until after the Florida Derby. In the end, the legal team for the Department of Pari-Mutuel Wagering issued a closing order for the complaint due to insufficient proof to issue an administrative complaint against Vitali. After all, the report stated, there was no proof the mare's broken knee had been aggravated by running her in a race, and there was no injury to track personnel or other horses. Tiz Mariand never ran again. She was retired and started a new career as a broodmare. Florida may be limited in what it can and can't consider when determining Vitali's fitness for license eligibility. Although the Association of Racing Commissioners International's records indicate Vitali would have 19 “advisory” medication violation points, those points have not specifically been assigned by any regulatory authority and Florida has not adopted the MMV penalty system. It can consider complaints against a licensee, but only if they have resulted in prior discipline (which Vitali's animal cruelty complaint did not). The Stronach Group, owner of Gulfstream Park, arguably has more options, if it wanted to block Vitali from stabling at the track or entering horses to race. As recently as early September, horsemen reported seeing Vitali sitting under an umbrella on the front side at Gulfstream Park, timing his former charges as they work out under the iconic Pegasus statue. This entry was posted in Ray's Paddock and tagged allan hunter, dr. george burch, Dr. Scott Hay, Florida department of business and professional regulation, Frank Calabrese, gulfstream park, Marcus Vitali, P.J. Campo, Tim Ritvo, tiz mariand by Natalie Voss. Bookmark the permalink.